In a letter to Representative Edward Markey, Facebook revealed it plans to pursue applications that require some pretty sensitive permissions. “We are assessing potential additions to the permissions screen that would appear when an application requests a user’s contact information, to determine whether those additions would provide even clearer notice to users regarding the information the application is requesting,” VP of global public policy with the social network Marne Levine wrote. While Facebook may potentially limit the amount of information minors are able to release, it wants to avoid modifying the screen itself. 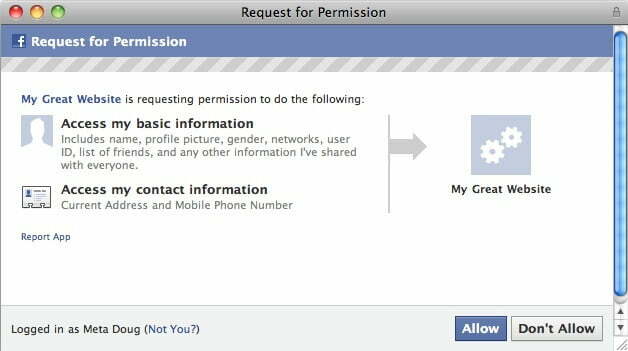 Suggestions of adding additional permission screens have been met with resistance, and Facebook points out it that users are statistically less likely to employ an application in such circumstances.